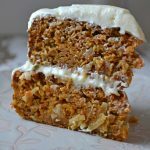 A delicious Layered Carrot Cake with Orange Cream Cheese Frosting. Pumpkin puree is added to this cake batter to make this cake rich and tender! First make the icing. Beat together the cream cheese and butter until it is smooth. Slowly add the icing sugar and mix until smooth. Add the orange juice and zest, mix well. Refrigerate until you are ready to use it. Prepare 2 round 9-inch baking pans. You can grease & flour them or line the bottoms with wax paper like I did in this post. In a bowl combine the flour, chia seeds, cinnamon, baking soda, baking powder, nutmeg, ginger and salt. Set aside. In a mixer, combine the pumpkin, sugar, buttermilk, vegetable oil, eggs and vanilla. Mix well. Add the dry ingredients slowly to the wet mixture, and using a spoon combine until the dry ingredients are moistened. Then gently add the carrots, nuts and coconut. Hand mix. Divide the cake batter evenly between the 2 pans, and bake for 30 minutes, or until a toothpick inserted into the centre of the cakes come out clean. When done baking, cool the cakes in their pans for 10 minutes before turning them out onto a cooling rack. When the cakes have cooled completely, you can ice them!